I haven't talked much about grad school, but it has been keeping me so busy. I just completed my first class this week (a class on creativity and the gifted learner that I have entirely enjoyed), and my final assignment was a two-part writing assignment. Part A was a four-to-six page paper for which I chose Steve Jobs as the subject. Wow. What an interesting guy. Part B was an assignment entitled, "This I Believe,"--a personal essay centering on our personal beliefs about creativity and how we employ creativity in our lives. 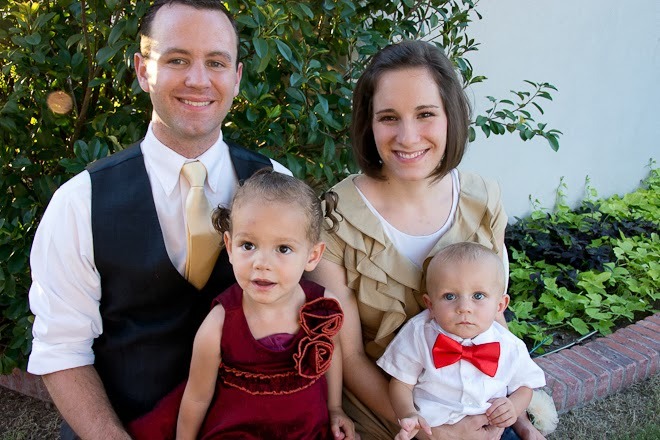 I thought back on one of my favorite blog posts of all time (written a few days before Heidi was married and first posted in April 2010), and I rewrote portions of it to reflect this assignment. I'm reposting it (in its new iteration) today. As long as I can remember, I’ve loved art, and Michelangelo was my first favorite. I remember looking through the pages of our family’s Bible, studying the images from the Sistine Chapel and admiring his sculptures. My favorite was and still is his sculpture of the Pieta. The intricacies of Mary’s folded robes and Christ’s curly hair have always captured my imagination, and then and there in my childhood family room with the mirrored wallpaper and shaggy green carpet, I knew I wanted to be an artist—a great artist of the highest skill. I was not so endowed. When I realized in college that you could major in art history, I knew I’d discovered my path. I may not be able to create these works of art, but I could acquire a level of knowledge and expertise and appreciation far beyond my abilities to create. So I did. Because I love art so much, I’ve always struggled with purchasing art of any kind to hang in my home. Mere reproductions or mass-produced posters always rang a little hollow for me. I always watch for something unusual, something unique. 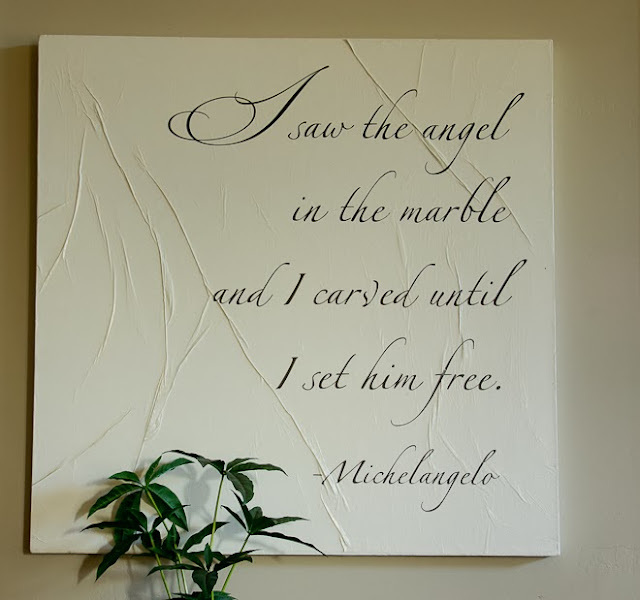 I saw this quote by Michelangelo hanging on the wall in a boutique eight years ago, and it spoke to my heart the moment I saw it. I knew I needed it, and its price tag only deterred me for a moment. It has hung in my home ever since. God gives mothers the privilege of becoming artists—sculptors co-creating with Him bodies for these spirits. Our mother bodies mold their physical bodies until birth, when it then becomes our job to help mold their souls. We teach them to eat, to sleep through the night, to hold toys, and to smile. These skills lead to sitting, crawling, walking, speaking. We struggle through potty training and sharing. We teach them how to be kind and how to love. This step of the process removes chunks of marble, big strokes that require never-ending maternal energy and time. We guide little hands as they shape Play-Doh spaghetti and meatballs, and we snuggle them into our laps as we read Green Eggs and Ham for the fifth time that day, just because it’s their favorite. We take them to museums, to the beach, and to the dentist. We expose them to Sesame Street and Mozart. We tuck them into bed each night with a song, a story, a drink of water, and a kiss and a hug. Our job is never done, but now the shape waiting inside the block begins to emerge. As payment for our labors, we receive stick-person drawings with four barely discernible letters scratched across the top and every rose picked from Dad’s perfectly pruned bush. These are the trophies of motherhood. Babies grow. They start school, and the strikes with the chisel become more deliberate, more careful—learning to tell the truth, to face failure and rejection, to be grateful. We drive to lessons, concerts, games, friends’ houses, and church. We correct homework, batting stances, and B minor scales. We teach by example. We mold with actions and words. We are simultaneously cheerleader and taskmaster. It is a difficult role to fill and an even more difficult task to find the perfect balance for each child. Now, the original block is no longer recognizable. There’s definitely a figure there. Children aren’t the only ones who grow and learn in this relationship. Mothers study and learn and try and fail. We invest thousands (in dollars, in hours, in tears) for self-help books, medicine, and education. We stay up late and arise early to learn skills that will help us guide and shape these developing little people. We adopt tips from world-class coaches and adapt our paradigms to new ideas. We try again and fail again, but the next time, we fail better. And we do it all because we are the mother. As our children grow, our mother strokes become even finer, even more subtle. We are the sounding board, the sympathetic shoulder, the confidante. We brush away tears and bask in triumphs. We step back and evaluate the sculpture with an ever-critical eye. What else do I need to remove? Where are the weak spots? Have I done enough in this area? It’s almost done. When the chisel work is complete, out comes the polishing cloth. The sculpture is practically finished. We listen and advise now, moving into the background. Occasionally we get a quick hug or an “I love you, Mom,” as the door slams. These are small prizes, but we now understand that our work as sculptor is its own reward. The questions arise: How long will I have to polish my marble angel, to refine it, to shine it? Will I ever feel like it’s finished? Will I ever be able to part with my master work? And who will be the one to fall in love with my work of art—and who will take it away from me forever? Will they be good enough—this trustee of my masterpiece? Will they treat my work with respect and awe—and love it, even more than I do? My first masterpiece is complete. My hammer and chisel and brush have rested for a time, and now it’s time to retire the polishing cloth. The angel has emerged, even more beautiful than I imagined. I am teacher, coach, inventor, master, and creator. I am the unsung artist, unheralded by the world. Yes, it was beautiful then and more beautiful now. This was also my favorite of your blog posts. It makes me cry every time...and especially now just be fore my little girl turns 18. (On Saturday). It was beautifully written.